OUR PRICE: $53.98 - Join Rewards Get $5 Dance Dollars On This Item! Bloch's versatile "Wave" split-sole sneaker features a lightweight breathable mesh upper, flexible non-marking outsole, and comfortable dri-lex with wicking properties. The built-in arch support elevates and accentuates the arch. 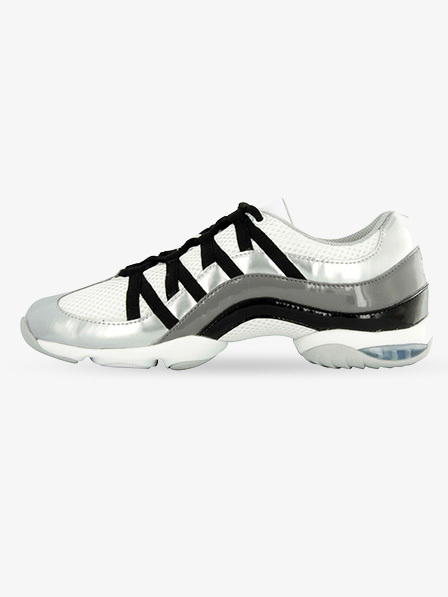 The cushioned heel provides shock absorption and comfort. The TPU spin spot is ideal for turning and retaining contact with the floor. Went on cruise, used them for dancing. They were absolutely great, especially near the pool where the floor was slippery. Very comfortable and very attractive. The sneakers have a good fit and good arch support. They also look terrific! I am a Ballet teacher who owns a ballet school and love having dance sneakers as my teaching shoes. They are very supportive while one can still demonstrate ballet fully in them which means one has to point the foot fully. The sizing recommendation is very far off on the website! Beside the shoe is almost falling off it also fits on the feet in a way that it is impossible to point. ( The front part is way too long due to the sizing) Bloch or Discount dance please change the sizing recommendation on your website!!!! After I discovered that my size 8 feet does not need at all a size 9 shoe, I have heard from other professional dancers and teachers that this problem constantly happens to them also. Seems like people would size 8 need a size 8 or maximum an 8.5 shoe. Now I have to deal with returning 3 different pair of shoes, all Bloch, after I spent considerable amount of time to try to figure out how to convert regular shoe size. Could it be made that it just would be called the same size as street shoes? Sansa for example does that and it works completely fine. I don't think I can afford the time to just keep testing out sizes, this should be a simple task, so all 3 shoes are just going back. Frustrating!!!!! Hello! Thank you for sharing your experience with these shoes. We will address the issue with the manufacturer and make them aware of the sizing discrepancy. One of our Customer Service representatives will contact you to shortly. Have had these in past and were wonderful but since they changed dance spot to different material they don't slide like they did before at all. Got these as a Christmas gift for my daughter in New Jersey and she absolutely loved them. Fit perfectly and she is already for her next Zumba class. So happy to get her something that she really loves. Thank you. 3 years later - still wearing them! I bought a pair 3 years ago for when I practiced at home and when I taught classes and wanted something that didn't restrict my dancing. I wear them at least 5 hours/week. I love these shoes, they're very light weight, durable, and comfortable. My only negatives about the shoes are they don't have much arch support and it's impossible to do pointe in them. I wear a women's size 8 in street shoes and bought a size 8.5 in these. They are snug, but not too tight (I like my toe to go to the end). The laces are very long, but my solution has been to double knot them and tuck the laces into the shoes. Love these sneakers. Super lightweight. I love these sneakers. I wear for zumba & have lots of foot problems. It is very hard to find shoes that provide adequate metatarsal support. These are very lightweight & comfy. They do run small. Luckily, I had read reviews & ordered a 9 1/2 (I wear a 8 1/2 in most street shoes). I probably would have been ok sizing up another 1/2. If you like room in your shoes I would size up 1-1 1/2 sizes. I don't know about durability because I have not had them long but plan on buying another pair. 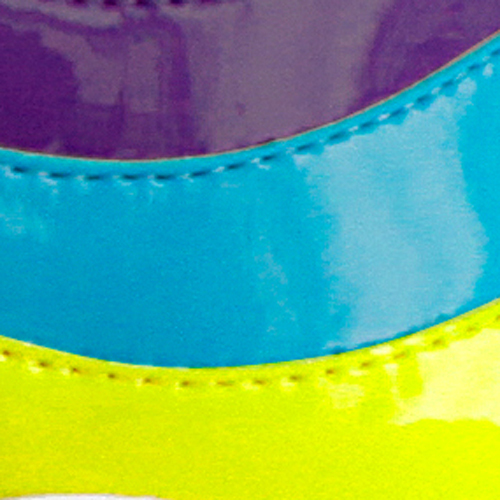 The sole material is changed and not in a good way. 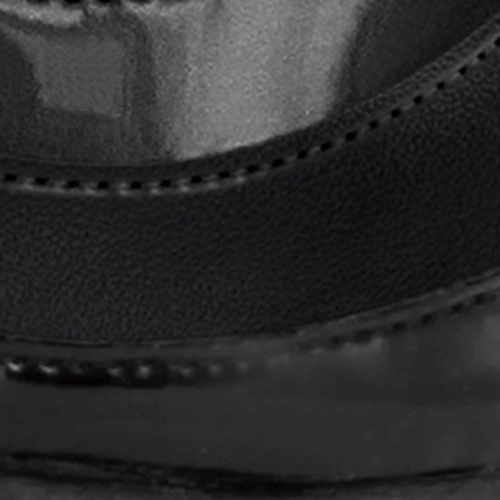 You no longer have the hard pivot spot that made this shoe so wonderful. Gone! Replaced with rubber substitute that interferes with turning. The white and the black soles have changed and are now a poor substitute for what was a great shoe. I tried and returned two pair. I now own two pairs of these great dancing shoes. I wear them for Hip Hop dancing and I love them. 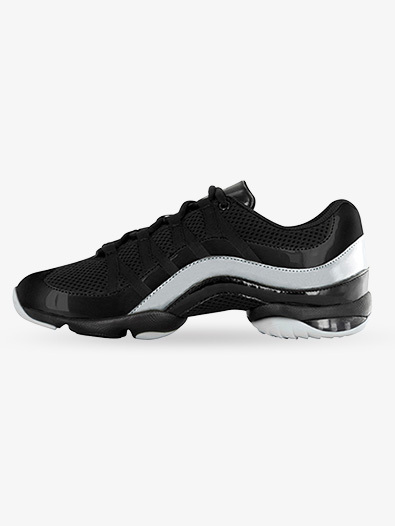 I workout 7 to 8 hours a week, so I need a good durable, comfortable shoe and this is it. I have it in the Silver and the Multi-color blue and red. I ordered a 1/2 size larger for both of them and that is perfect. You will be VERY PLEASED. Thinking about ordering another pair soon in a Purple. I've worn the Bloch Boost for the past few years but decided to try something new since I found the Boost support to be a little than ideal due to the mesh upper. I've also almost rolled my ankle a few times. I tried these because they looked lower profile and had fun colors for Zumba. The fit was very different than the Boost. I ordered the right Bloch size but the shoe material is different. They ended up feeling bulky through the laces/width but short since the leather toe accents interfere with how your toe fits into the toe box. I have a "normal" foot. Like another poster said, the shoe laces are super long! I have to triple tie so I don't add to my slip risk. Part of the problem maybe be the width bulk which means I have to tie them really tight to feel supported. These shoes are slippery because the spin spot is plastic! It also clicks a bit when you walk on wood dance floors. Leaping and quick lateral moves feel a little scary (esp when you've had knee reconstruction) despite the rubberized sections of the sole. I've worn them outside a few times hoping the plastic will rough up a little but I haven't noticed a change. These also feel pretty flat. To address the overall big and flat feel, I inserted a old pair of Powerstep shoe inserts. That makes them wearable. I might have returned them but the night I tried them in a class they ended up with some wear marks in the plastic area. I'm not sure about durability since i've only had them a month. The plastic/vinyl materials don't seem as solid as the leather/mesh Bloch Boost but only time will tell. Pros? They are cute and I've had compliments. They are VERY light. The plastic spin insert is slippery BUT my painful patella issues have improved noticeably which is a major bonus for me. I'll keep trying to make them work just for that reason. They could be great shoes if Bloch did a little tweaking to improve the overall fit. I bought these for two reasons: to wear to Zumba and to practice clogging. The spin spot is TOO slippery for Zumba though! There is no grip to it at all and roughing them up on asphalt didn't help. I was sliding all over the floor. However, that does make it kind of perfect to practice clogging/power tap. So I will happily continue to use these to practice clogging, but I won't try wearing them to Zumba - I got Ryka shoes instead. For some reason the laces on these are crazy long - I am debating between just chopping them or buying shorter ones. They are very comfy, though, and I followed the size recommendations of going up 1.5 sizes. I wear a size 8 and the 9.5 fit perfectly. We purchased these dance sneakers for our daughter who takes Irish dance lessons. We wanted a shoe that she could use in the house to practice her hard shoe dances. This shoe fits well, is comfortable and does not mark the hardwood floors. It definitely runs small. She wears a child's 1.5 (equivalent to a 3.5 adult), and we bought a 5 adult for her in these. They fit perfectly. Bloch shoes are GREAT! However, you really have to be careful when selecting the correct size and style that best suits your needs. I have Bloch Boost DRT (pink & royal) in a 1.5 size larger than my regular shoe size and they work just fine. When I ordered the same size in this shoe, it was a little short. Also, this shoe was a little snug for my comfort. I like to wear cushioned socks, which probably contributed to fit. Although the "wave" didn't work for me, they worked great for my friend. Another concern is if you have flat feet like I do, this really isn't the shoe for you. There just wasn't enough arch support for me. I will be sticking to the Boost from now on. P.S. I didn't have to return since my friend got the same size. She bought my pair too. I had to return the shoes because they were way too small. I followed the directions and orderer 1/2 size larger and they were not going to fit. Had to send back and pay way too much postage. yours being quite small. Very disappointed that they didn't fit won't order again unless I am sure they will fit and you have no way of assuring me of this. I asked if you had forms of the bottom of the shoes to measure???? ?would like to try again but do not want to take the chance, sorry for the negative feedback but this is the truth. I feel that WITHOUT any socks, it feel ok. With any kind of socks or tights, it feel rather tight. Still, great shoes and very sleek! My street shoe size is a 9 1/2 wide, so I ordered a 10 in these shoes. I was happy with the fit because I could tell they would stretch out and work with my feet. These shoes are solid and comfortable, while still being very flexible. I ordered them in black and will probably be ordering more colors. These shoes are worth the price. I recommend this dance sneaker to anyone who does any kind of physical dancing. I love my first pair that I am buying a second. I have had many complements and people ask where I have bought them. I bought inserts for extra support because I wear them for Zumba, being an instructor. The sneakers have comfort and as opposed to the other review, do not slip on the wooden floor. Shoes work great for a dance team! I ordered these for my entire dance team. My girls love them and they think they are very easy and comfortable to dance in. The gym floor they practice on is a bit sticky and the dancers have an easy time turning in them. They also love the purple color. We ordered a full size bigger than the street shoe and they fit great. This is my 2nd pair of Blochs. The first pair I bought in a dance store and wore them out. I use the shoes for Zumba which i am addicted tooo. I love Purple and when i saw the purple wave i had to get them. I bought them a size bigger after i read the previous review , they fit perfectley Great product and they are great for Zumba esp for wood floors. As a Jazzercise instructor, I have tried many dancesneakers. I've been a devotee of the Evolution by Bloch for several years, but I thought I'd try the Wave for a change. Not only do they look cool, but I taught a class in them the very first time I put them on. That was risky, but the shoes proved to be perfect for teaching. They are supportive and flexible. I recommend that you size up 1 to 1 1/2 sizes from your street shoe, e.g. I take a 6 in a street shoe; in the Wave I need a 7.5. I'm going to order another pair in another color combo. Can this shoe be used outside? Our dance/high team performs field shows with the band in the fall. The "Wave" split-sole sneaker is meant to worn and used on a dance floor. We can not Guarantee the durability if you are using the item outside or in a grassy area. IS THIS SNEAKER FOR MEN? 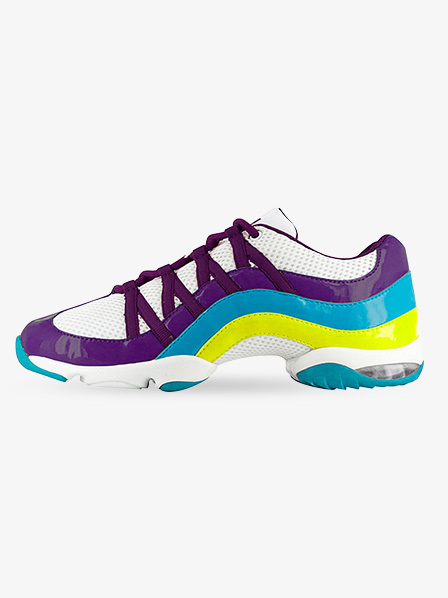 This is a Unisex shoe, but it is fit for women. Men need to order 2 to 2 1/2 sizes larger than their street shoe size. Is the fit for the Wave the same as the Boost? I know my size for the Boost, but I want to get a pair of these (Bloch Wave) too. Is the fit the same? (sizing and width) Thanks! The fit is different from the boost to the wave. The boost recommends (for women) ordering 1-1.5 sizes larger than street shoe and (for men) 3 sizes larger than street shoe size. 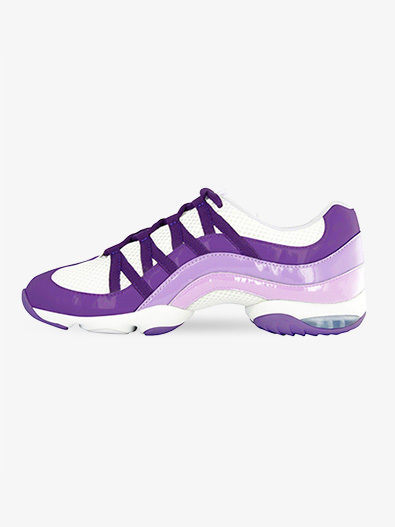 In comparison, the wave recommends for women to order same to .5 size larger or for men to order 2-2.5 sizes larger. For the new shoe though we do not recommend sizing off of an alternate dance shoe but off of your regular street shoe size. The width should be relatively the same. Is the sole of the Bloch "Wave" the same as the one on the Bloch "Twist?" 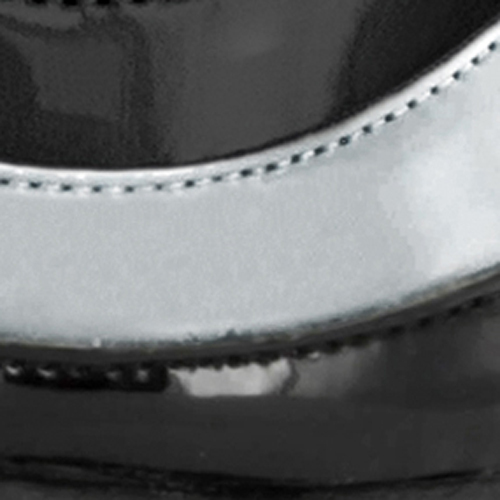 The solid structured sole is the same. 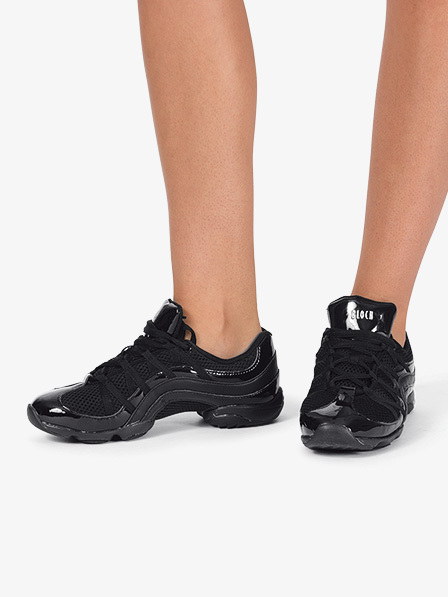 Does this shoe have support for just walking around?? 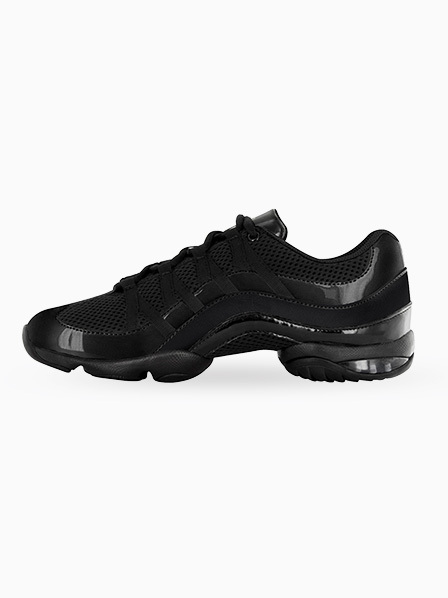 This shoe is designed for dancing, with the split sole design and offers support for dancing, should be ok for just walking around however it does have a different feel since its a split sole not a full sole design as most walking sneakers. Does this shoe have support for just walking around?